Don't buy a Mac, save the planet? My last generation Mac Pro is more computer than I need now, or probably will need for a couple of years (that is, if Apple ever ships that darned graphics card with the mini DisplayPort, which has been delayed a few weeks), yet I still had that urge to buy a new one. I am sure, dear reader, that you too have suffered this inexplicable hankering to upgrade your gadgets to the latest and greatest without actually giving a moment’s thought as to whether or not you actually need whatever gewgaw or gizmo has grabbed your attention. 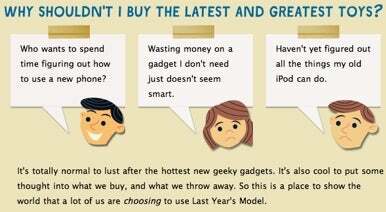 Last Year’s Model is a new project that showcases how various über-geeks have decided they're just fine with last year’s model (highlighted on the Web site at the moment are Macworld contributor and famed lifehacker Gina Trapani and Digg's Kevin Rose), but you can get in on the act too. Blog or tweet about how you’re happy with your current tech and tag the post with #lastyears and you too can feel good about your cheapskate…er eco-friendly ways. I’m of two minds about this concept. On the one hand, purchasing fewer consumer goods is a good idea for the planet (of course, most of those goods have already been produced and transported to retail chains, so the savings aren't as big as you might think), but, on the other hand, we are in the midst of a global economic meltdown. It might be a good idea for those who have a little extra spending money in their pocket to get out there and spread the wealth around a little. Then again, I am neither an economist or an expert on the environment, so you should probably take whatever I say with a large grain of all-natural organic sea salt.